I don’t know about your family, but in mine getting vegetables into our diet can be a bit challenging. We want to set a good example for our 9 month old twins but veggies seem like more hassle than they’re worth. I have a few that I like, green beans and peas. So, I’ve tried all the tricks of the trade to get my husband, Mr. Scents, and myself to eat more variety. I’ve covered them in cheese, hid them in meat dishes, and even added so much salt I’m not sure it could still be called a vegetable. 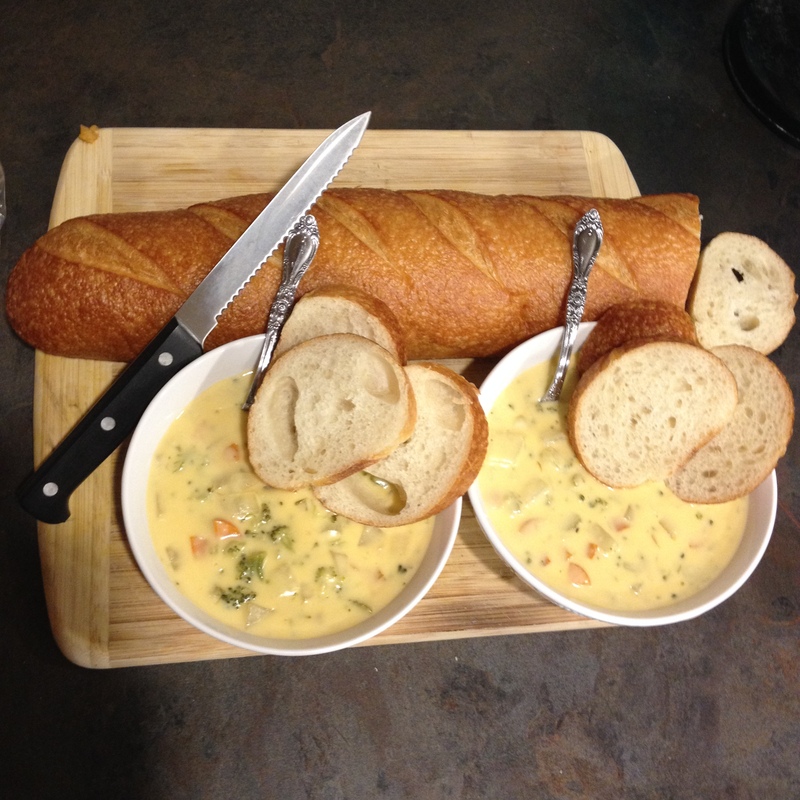 That is, until I found this awesome recipe for Vegetable Chowder. The first time I made it people were going back for a second bowl. If that didn’t tell me I had a hit, it was Mr. Scents asking me to make it again. As I continued to make this recipe it evolved from a simple Veggie Chowder. True to my nature, I experimented and the end result was my Bacon and Cheese Veggie Chowder. Bacon and Cheese because what doesn’t taste better with bacon and cheese? The recipe below is the bones. In all my experimentation, I discovered the base for this chowder, the chicken broth cheesy goodness, goes well with many combinations. You can change out the veggies for things that are in season or to use up those vegetables before they go bad. I’ve made variations that have squash, changed up the cheeses, and added chicken. All of these variations turned out delicious. We like to have this as a main dish and use leftovers for lunch. That said, it could also be a course in a fancy multi course meal. It serves great with slices of French bread or some oyster crackers. I imagine it would also go great in a bread bowl. Sautee carrots, celery, onion, and garlic in 1 and ½ tbsp of butter for 3-4 minutes, or until onions begin to brown. Add in the chicken broth, potatoes, and thyme and bring to a boil then lower heat to medium and cook 15 minutes. Then add in broccoli and cook another 5 minutes or until all vegetables are cooked through. Meanwhile, melt remaining 4 tbsp of butter and mix with the flour. Add it milk and whisk consistently to keep smooth. Bring to just boiling and once mixture begins to thicken add cream. Remove from heat. Once veggies are cooked in soup mixture add in cream mixture and remove all from heat. Stir in cheese until melted. Take the bacon strips and crumble into soup and stir. Optional: garnish with chopped parsley.